In a little red shack on the road to Mt. Bachelor you’ll see (and smell!) Baldy’s Barbeque Westside. Baldy really exists and from 11am to 9pm daily you’ll find him and his crew smoking up and serving up falling off the bone meats and savory sides for lunch and dinner. There’s a reason this place has been voted Bend’s Best Barbecue every single year since it opened back in 2005. Baldy spent years learning his craft from a true Southern pit master, honed his skills in Aspen, Colorado, then brought his goodness to Central Oregon. Diners happily tuck in to platters of house-smoked brisket, chicken, baby back ribs, turkey, ham and pulled pork. You can also get a taste of the sea with grilled BBQ shrimp, smoked salmon and blackened catfish. Or, make your own mac with a choice of meaty mix-ins, build a burger just for your taste buds or give the BBQ Sundae a spin. On Fridays and Saturdays, the special prime rib dinner is on the menu, but only while supplies last so show up early with your friends and your appetite. Eat in or get your order to go. Baldy’s is also ready to party, from pick-up platters for a crowd to a full-service catered Hoedown for groups of 40 or more. 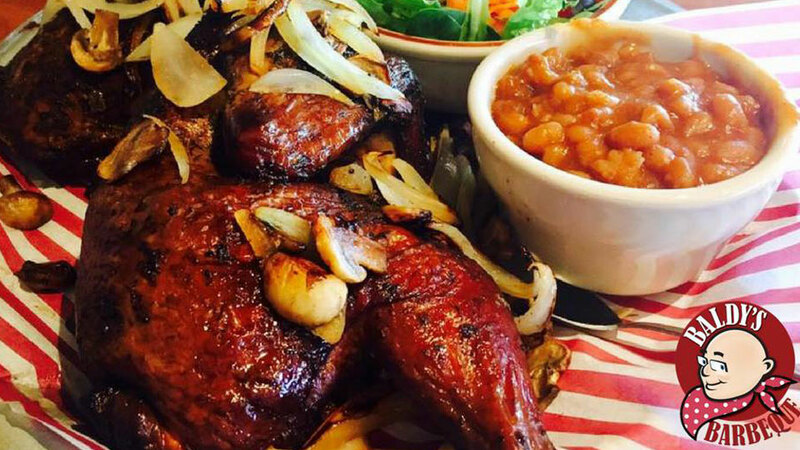 However you choose to enjoy it, you’ll find no finer barbecue in Bend than Baldy’s.